As the title of this column suggests, I'm an admirer of Bob Dylan's work, from the world-shaking epics to the off-the-wall obscurities. But I admit that even I quailed this March when I heard he was about to release yet another collection of classic crooner covers -- in a three-record set, no less! I'd enjoyed his first couple of forays into this area, especially the moody "Shadows of the Night," where he sang with more genuine emotion than he'd shown in years on record. But the thought of 30 more of these seemed a bit much. I'm not one of those fans who requires Dylan to redefine the zeitgeist or hale souls out of men's bodies every time he strums a chord, but still, I would've preferred some new songs -- or his long-threatened album of Charley Patton covers -- to more mining of the Sinatra seam. And to my surprise, I found I couldn't stop listening to it. I understood the criticisms of "Triplicate": too much of a muchness, too creaky of a croakiness, too remote of a removeness from the contemporary world, etc. But the more I listened, the more I sensed something else going on. Not just a lightsome stroll through "the Great American Songbook." Not just an exercise in nostalgia, or a contrarian's nose-thumbing at his audience's expectations. Instead, what I heard was the careful construction of an alternative -- even radical -- worldview: a modern moral code masked (and anonymous) in archaic forms, a sharp counterpart and challenge to the prevailing zeitgeist. The album concerns itself entirely with demotic themes, the stuff of life for ordinary people: lost love, unrequited love, unfulfilled yearnings, the looming shadows of mortality, with occasional bursts of joy and gentle swagger ("the best is yet to come"). The vocal delivery in most of the songs surpasses "Shadows" -- and rivals anything in Dylan's canon -- for emotional depth, emotional reality. But with the whole "American songbook" to draw from, the selection of cuts on "Triplicate" shows an obvious crafting of a particular vision. Dylan himself described the triple album as a story, beginning with a jaunty fellow lightly repining over a lost girlfriend (regretting the "new blue pajamas" he'd bought for the affair) and ending with a love-broken man wondering why he'd even been born. At some point it occurred to me that the stories of the album, delivered by a male narrator, were describing -- and enacting -- nothing less than an alternative view of masculinity: a conception of manhood expressing itself in openness, tenderness and above all, vulnerability. Throughout the album, there is a courageous embrace of emotion and the possibility -- and acceptance -- of deep emotional pain. Indeed, in many of the songs, there is a sense of surrender: to fate, to time, to mortality, to the fragility of love, to the ending and rending of things. Here, across a full three albums, there are none of the withering put-downs that Dylan is famous for: no hoodoo women, no backstabbers, no soul-stealers, no Miss Lonely getting her righteous comeuppance from Napoleon in rags. There's just a series of ordinary men in ordinary life, hoping to be worthy of the woman they love or long for, or else ruminating -- not raging, not ranting -- about a wonderful, beguiling woman they've lost. There's no place in these songs for the triumph of the will, for braggadocio, for imposing one's desires through bluster and violence. A greater contrast to the present zeitgeist -- especially the imperial burlesque of our preening political, corporate and media elites -- can hardly be imagined. In a world where war is the prevailing metaphor and mode of being, where manhood is measured by the throw-weight of missiles and chest-thumping displays of dominance, here comes an old man quietly asserting the primacy -- and nobility -- of the loving heart, of brokenness and gentleness, of fierce, enduring passions bounded by a respect for the beloved, whatever the outcome of the encounter. In some ways, it reminded me of a phrase I once used -- in my brief stint as a Russian literature teacher -- to describe the not-dissimilar Weltanschauung found in the poetry of Boris Pasternak: "a power without the power of resistance" -- which in Pasternak's case, as with Tolstoy before him, nonetheless came to stand as a stark rebuke to the powers of their day. 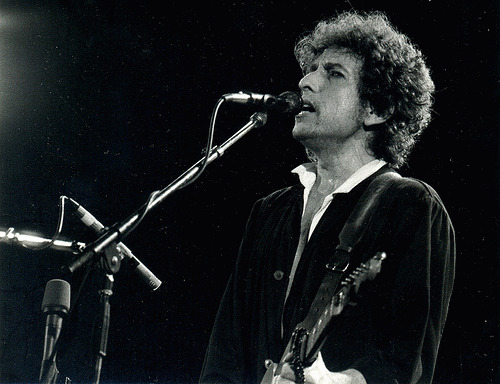 "Triplicate" is not on that level, of course, but it's striking that Dylan crafted this alternative Weltanschauung from old songs largely written by immigrants or the children of immigrants: survivors of repression, violence, bigotry and persecution. This was not the lineage of the Indian-killers and slavers, the aristocrats and robber barons who gave us the bellowing hoo-rah of "American Exceptionalism," now swelling in a spectacular excrescence in Washington. This was something more universal, more subtle, a work of spiritual depth hidden in a popular song.